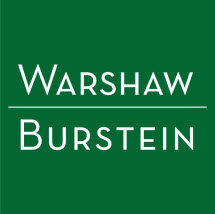 Located in New York, New York, the law firm of Warshaw Burstein, LLP, offers comprehensive legal services in a variety of practice areas to meet the needs and goals of a diverse range of clients. Originally established in 1927, our law firm has served the citizens and businesses of New York City for the past 90 years. Today, our team of dedicated and experienced attorneys continues our tradition of delivering the personalized assistance and support our clients deserve for all of their legal issues. Providing superior legal counsel efficiently and cost-effectively, Warshaw Burstein, LLP, stands ready to assist you in any way we can. For more information about the services we offer or to discuss your specific needs and goals, you can contact our law office to schedule a free initial consultation with one of our dedicated and compassionate attorneys.